This alternating pressure pad consists of 130 individual bubble cells. This app pad (only) is a great backup or alternating pressure pad replacement. This APP pad will work with any alternating pressure pump. This alternating air pressure pad supports 300 lbs The bubble pad design provides superior comfort and support. Alternating pressure pads prevent bedsores and pressure ulcers. This pad is made of a long lasting durable heavy gague premium vinyl. 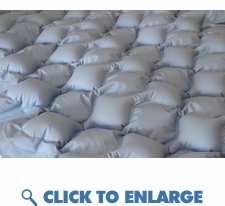 Pad only (pump is not included) 1 per carton Pad size 78" x34"
This alternating pressure pad consists of 130 individual bubble cells. This app pad (only) is a great backup or alternating pressure pad replacement. This APP pad will work with any alternating pressure pump. The bubble pad design provides superior comfort and support. Alternating pressure pads prevent bedsores and pressure ulcers. This pad is made of a long lasting durable heavy gague premium vinyl.